Illinois Capacitor Supercapacitor (EDLC) Modules expand power storage options with greater capacitance and voltage options! Power connectors are reliable with the ability to support high current and when mating and unmating are required, all at an affordable price. They are manufactured by Cinch. They were also made by Vernitron Beau who was acquired by Molex. These connectors are offered in two series 300 and 2400 with a variety of cable and panel mounting options. Note: Beau also made a Series 4400/ 15 amp that can be installed from the back of the panel or chassis. It is compatible with series 2400 and 400 style connectors. 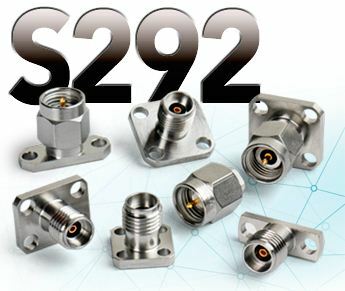 Standard Radio has over 200,000 of these versatile connectors in stock. They are offered in several mounting configurations. Whatever your applications, please call us with your requirements and we will promptly meet your needs. With over 67yrs of experience we will send you the right part at the right price. Heyco Products now offers HEYlock Locking IEC Power Cords. The Power Cords eliminate accidental and vibration disconnects and are universally compatible - no mating plug or receptacle required! They are designed for retrofit as a plug and play replacement for existing power cords and available in Universal C13 to C14 and C13 to 5-15P. For more information about HEYlock Locking IEC Power Cords, please click here. SE Relays (Magnecraft) has announced a price increase for June 1, 2015. EcoFlex Pur is the newest addition to Alpha's recyclable EcoGen line. It is a 600V ZH Pur cable with mPPE inners and significant size and weight savings, as well as the high quality you are accustomed to with EcoGen. The EcoFlex Pur is suitable for: machine tools, outdoor applications, mining, industrial machinery, construction machinery, agricultural equipment and assembly & production lines. Applications: General purpose filtering, audio coupling and cross-overs, DC blocking and much more! TTA Series: General Purpose +85°C rated at 2,000 hours. TMA Series: General Purpose Extended Life +105°C at 2,000 hours. TLS Series: Low Leakage +85°C rated at 2,000 hours. BPA Series: Bi-Polar/Non-Polar +85°C rated at 2,000 hours. Film Capacitors come in two standard designs, a film-foil combination where plastic or paper films are interleaved with metal foils that serve as electrodes, or as a Metalized construction where film has aluminum or zinc deposited in it to serve as the electrodes. Metalized film capacitors show there advantages where smaller applications are needed due to their smaller size and lower weight. Metalized capacitors also have a built in “healing” property where in the case of voltage stress the film will clear itself and heal the point of damage. Due to this “healing” property most metalized film capacitors are tolerant of overvoltage. Circuits which require high currents may need a film-foil combination capacitor. The heavy foil of this combination offers low electrical resistance and excellent thermal dissipation preventing internal hot spots and optimizing the circuit efficiency. Impregnated capacitors are recommended for high voltage circuits where corona may be a problem. Wax is suitable for a lower temperature application. For higher temperature application oil is a suitable impregnant. These capacitors can be either metalized or film-foil combination. Also, series wound units are used to prevent corona. San-tron 7/16s Are The Answer When Every dB Counts. Innovative design and meticulous machining make San-tron 7/16s the only choice for critical signal transmissions. Made of the highest quality materials to ensure the best performance in even the harshest environments, they consistently deliver passive intermodulation performance as good as -175 dBc. DLI makes capacitors for high frequency applications demanding near perfect, almost lossless devices. Their components use specially developed, proprietary materials tuned to provide optimized high Q, low ESR responses. They are the world’s largest supplier of single-layer capacitors, typically used in hybrid and high-frequency modules, offering the broadest range of material and device options. Our multilayer capacitors include traditional “porcelain” products, as well as highly temperature-stable and extremely low ESR chips and a family of broadband blocks. The 40 GHz Coaxial Solution. 40 GHz or K-band range. 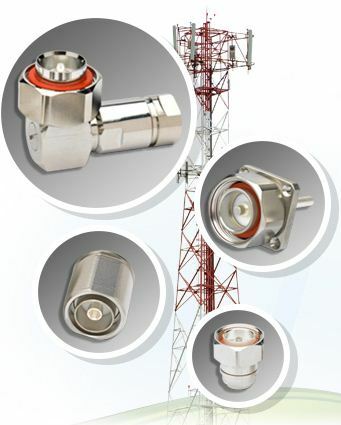 These high- performance coaxial connectors are designed to the 2.92 mm standard and offer a compatible mating style to Anritsu K Connectors, SMA, WSMA, and 3.50 mm connectors.